Gear is expensive. Spend a little time shopping for equipment, and it won’t take long to learn that a proper outdoor kit can really hurt the wallet. There’s plenty of cheap stuff out there, but I’ve been burnt enough to know that often you get what you pay for when it comes to outdoor gear. There are exceptions, however, and if you’re starting your outdoor kit, the best twenty dollars you can spend will acquire you a Mora Companion, one of the best damn knives you didn’t know you needed. The best knife you’ll find for less than $100. The Mora Companion is technically the MoraKniv Companion, through pretty much everyone you meet will just call the knife a Mora. 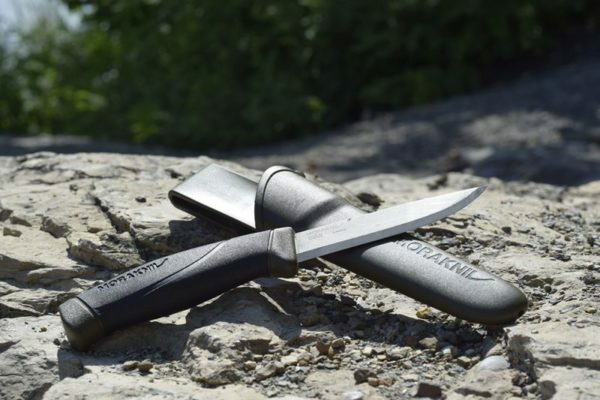 They’re incredibly popular with the bushcrafting community because they’re high quality but also inexpensive, a difficult pairing to find when it comes to reliable outdoor tools. 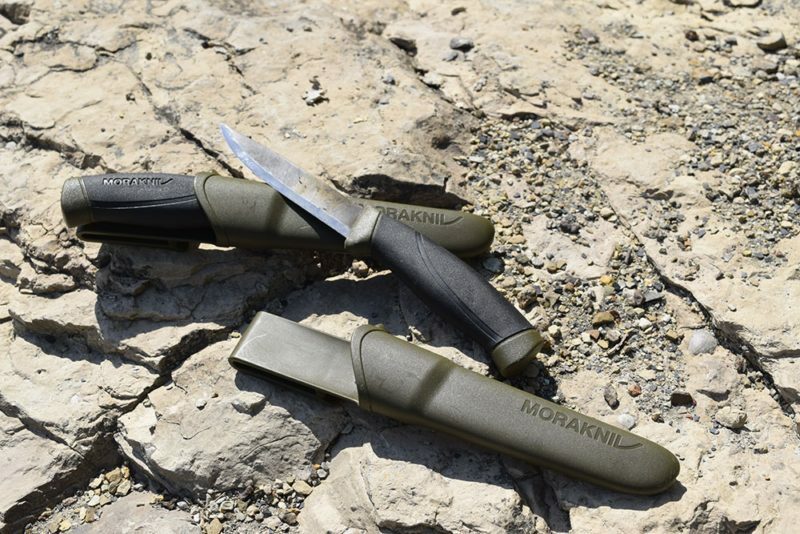 Morakniv hails from Mora, Sweden, where they’ve been making great knives since 1891 and though the company has changed over time, the commitment to quality knife-making remains the same. 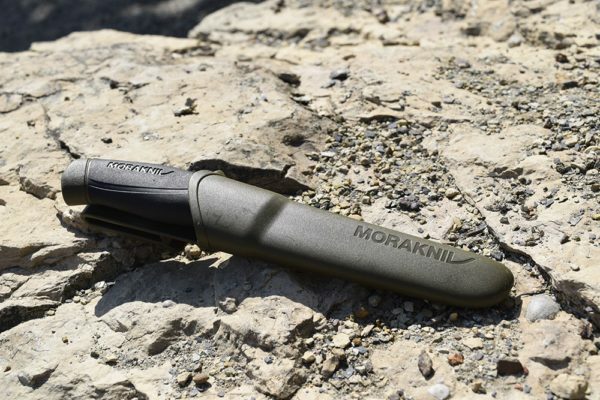 The Mora Companion sports a 4.1 inch blade, which is long enough for most camping or bushcraft tasks. Some more experienced trekkers and bushcrafters might prefer a longer blade, but I’ve never had a need for anything larger. The rubber grip on the handle is purely utilitarian; while it lacks the aesthetics of wood or bone handled knives, the rubber enables you to hold the knife safely, steadily, and securely, even in rain or while your hand is sweating. The Mora’s handle isn’t beautiful, but the grip is solid. The sheath isn’t beautiful either, but will keep the Companion where it needs to be. To enable you to put plenty of force behind the knife without losing precision, the Mora Companion sports a three quarters tang. This means that the steel of the blade extends into the handle for three quarters of its length. Some knives boast a full tang, but I feel that in a knife of this size to be used as an outdoor tool, a three quarters tang is more than sufficient, and a full tang would add excess weight to knife. Speaking of weight, the Mora Companion is incredibly light in the hand. Weighing in at 124.5 grams, you don’t have to worry about wearing yourself out while performing tasks like cutting rope or batoning firewood. The light weight paired with the comfortable grip means that you’re less likely to experience fatigue-related accidents. Safety is a good thing! 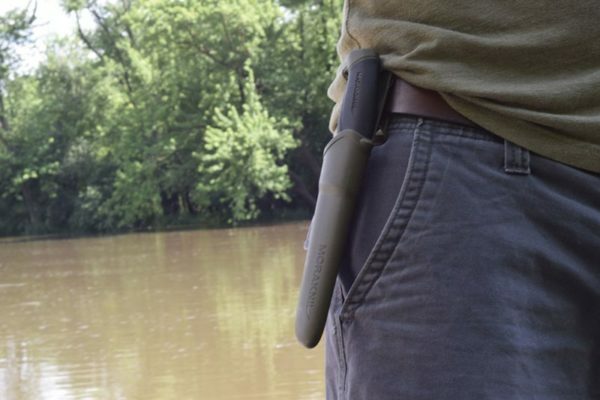 You can get a Mora Companion with either a stainless steel blade, or one made of carbon steel. There is an unending battle on knife forums online about which is superior, why that’s the case, so on and so forth. I’m not a metallurgist, but here’s my take on it. Mora’s stainless steel blade is hardened to HRC 56-58, which makes for a strong knife, that’s resistant to moisture, and can take a good deal of abuse. Their carbon steel is a little harder at HRC 58-60, but it’s also more brittle. Don’t use the tip of the blade to do any prying (actually, don’t do that anyway). The carbon steel blade is more prone to rust, so you will have to spend time maintaining the blade, but it’s also a bit more wear resistant than stainless steel. Carbon steel takes a sharper edge; you will never get your stainless steel blade as sharp as the carbon steel. I feel like it’s easier to sharpen a carbon blade in the field, but that’s purely anecdotal. For me, the stainless steel’s primary benefit is aesthetic; it’s not going to rust or take on a patina, so it stays shiny. No matter how well you care for the carbon steel blade, eventually it will take on a gray matte appearance, and perhaps even an oxidation pattern. I don’t care about the shininess of the blade, so carbon steel has always won out for me. Mora ships the Companion with a Scandinavian or “Scandi” grind. The grind of the blade refers to the shape of the blade’s metal as it tapers to the cutting edge. Since the Companion has no secondary bevel, sharpening is an easy process. 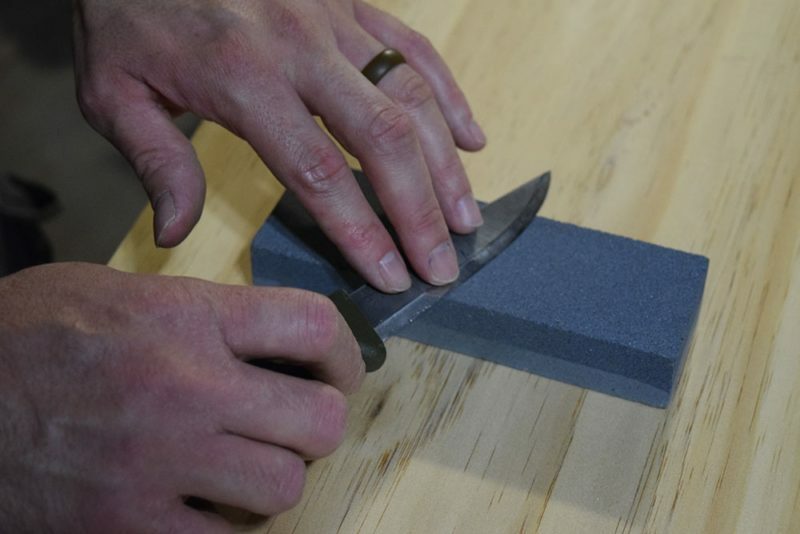 You simply lay the single bevel flat on your sharpening stone, and run the blade down the stone. No special angles, just consistent work on both sides of the blade. 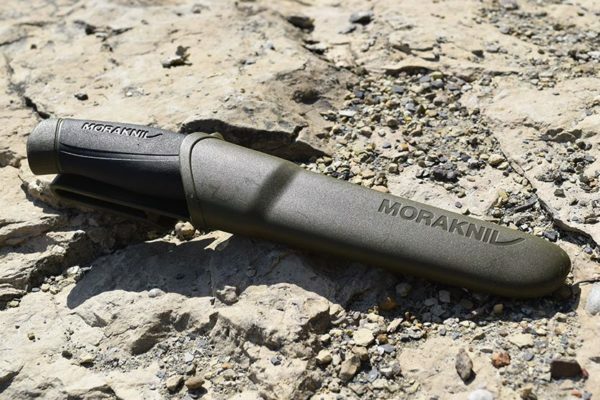 Sharpening a Mora is quick, easy, and simple to do in the field. The Scandi grind dulls faster than other knife grinds, but is much more easily sharpened, especially in the field. In my opinion, this balance works out perfectly; you may need to sharpen the blade more often, but you’ll spend less time doing so. …But not quite. There are a few flaws that are worth noting. The first is the grind and polish on the spine. The Mora Companion’s spine won’t draw sparks off of a fire steel or similar firestarter. That’s because they grind, polish, and buff the spine before it leaves the factory. Mora does sell specific bushcraft models with an unpolished spine, but I’ve never felt the need to buy a different knife; instead I took a file to my Mora Companion’s spine. After a minute of filing, my Mora will make the sparks fly with no problem. If you want to use your Mora to start fires, you’ll need to file down the spine for a few minutes. The sheath, while functional, leaves a little something to be desired. It clips readily to your belt, and I’ve never had any trouble with the sheath coming loose, or the knife coming out when I didn’t want it to. I would prefer a sheath that could be worn horizontally across my back on my belt, or has additional options for holding my firestarter. I’ve tried plenty of aftermarket solutions, but haven’t found any of those that I like either, so I won’t judge Mora too harshly. The Companion’s sheath isn’t perfect, but it is functional and safe. Some have criticized the use of a three quarters tang, instead of a full tang. I’m not concerned about this, but it is worth noting that other quality outdoor knives, like the ESEE 4, do come with a full tang. That’s not a criticism of the Mora, but if a full tang is a priority to you, the Mora Companion might not be the right knife for you. The Mora Companion is a damn good knife! Nothing against the ESEE; everything I’ve heard indicates that it’s a great knife too. It’s just a little out of my price range. The Mora Companion, however, is an excellent tool that’s accessible to everyone. In my opinion, a good fixed blade knife is one of the best outdoor tools at your disposal. 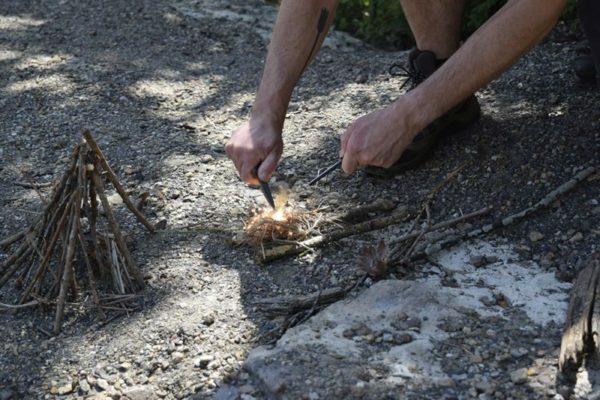 Using a knife properly, you can cut down a tree, prepare food, process firewood, dig holes, and whittle other tools. 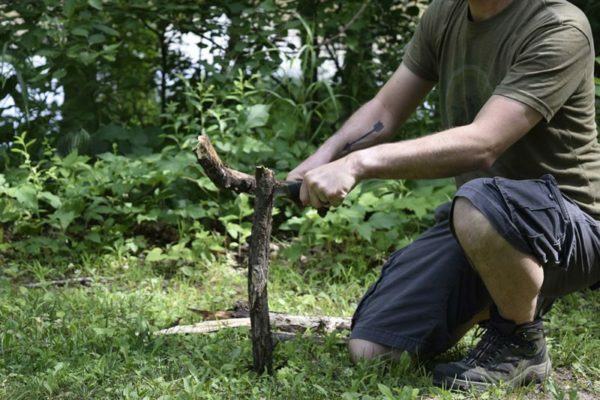 Sure, your Mora will never cut down a tree as well as an axe, dig a hole as well as a shovel, or process firewood as well as a hatchet and saw, but you get some of the functionality of all of these implements in one lightweight tool. That’s the versatility a good knife brings to the table. The Companion is a versatile tool; here I’m using it to split open a damp branch to get to the dry wood inside. The Mora Companion isn’t the only knife out there, but it is the only knife in this price range that boasts this kind of quality. If you’re looking to add a knife to your kit, this is the one I would recommend. I carry my Mora every time I’m in the woods, have used it for hundreds of tasks, sharpened it in the field, and bought one for my wife. As far as I’m concerned, the Mora Companion is the knife to buy, and will serve you well for years to come (even if you decide to upgrade later). The Mora Companion is a purchase you won’t regret.